This recipe must be as old as the hills. 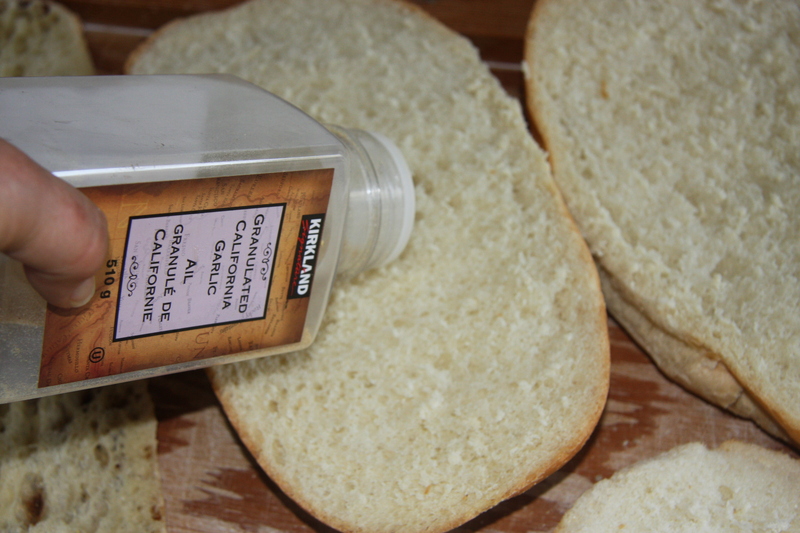 I see people buying the prepared garlic bread in the store. Looking at it, it doesn’t look fresh, it doesn’t look appetizing and it costs a fortune compared to what it would if you made it at home. There are things that I would buy prepared and things that I would not. Garlic bread falls under the would not. Once you make this recipe you won’t buy the ready made stuff again. 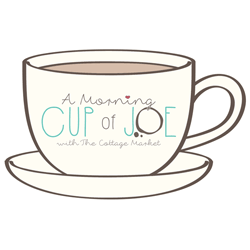 There hasn’t been a time when I have made this that someone hasn’t remarked on how good it is. Just recently a friend of my son’s was eating it and part way through he said “I can’t stop eating this, it’s delicious!” I replied “Really? 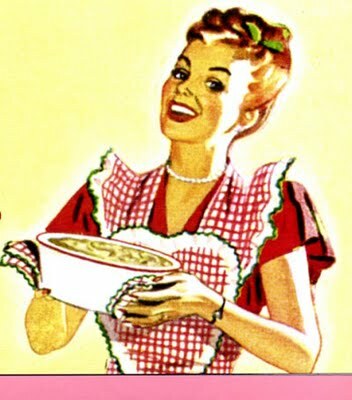 Well thank you.” It is because of that remark that this recipe is being posted. It just made me realize there are people out there that don’t know how to prepare it and obviously haven’t had it. Normally I make this recipe with just regular sliced bread. It can be any kind. Rye, white, whole wheat, multigrain, whatever floats your boat. 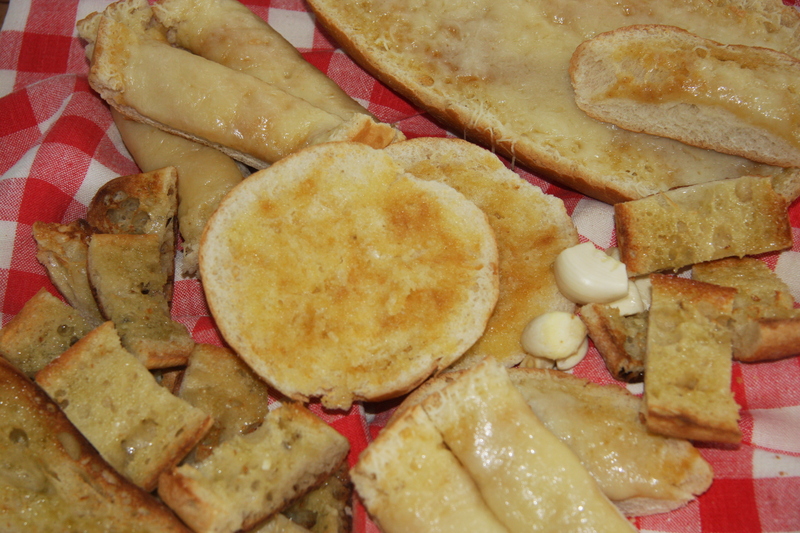 To post it I decided to jazz it up a bit but it is the same basic recipe for all the garlic breads made. As you can see I decided to use 3 different breads. 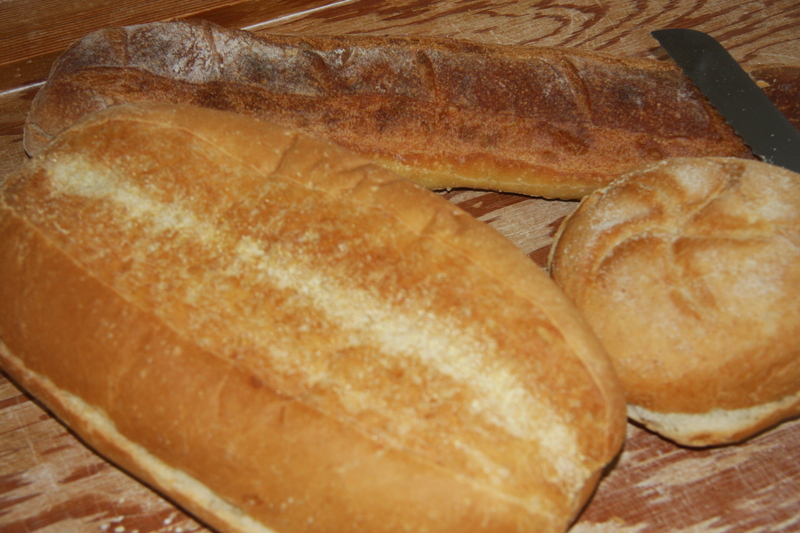 An Italian loaf, a Ciabatta stick and a Kiaser bun. Always keep in mind that 99% of the time I use just plain sliced bread. Cut them in half, length wise. Sprinkle each piece with granulated garlic. 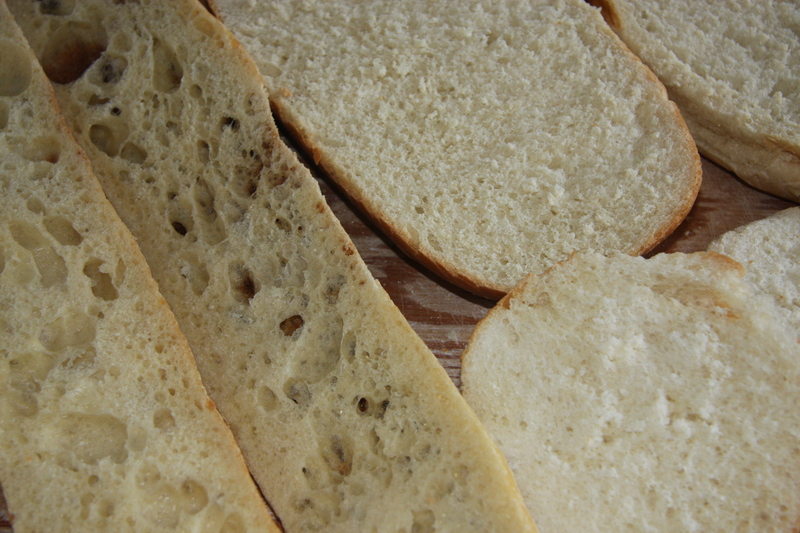 Spread each piece of bread with softened butter. I just keep the butter at room temperature. Again, as much or as little as you want. Though the first time you make it lean on the much side. As they say, everything tastes better with butter. 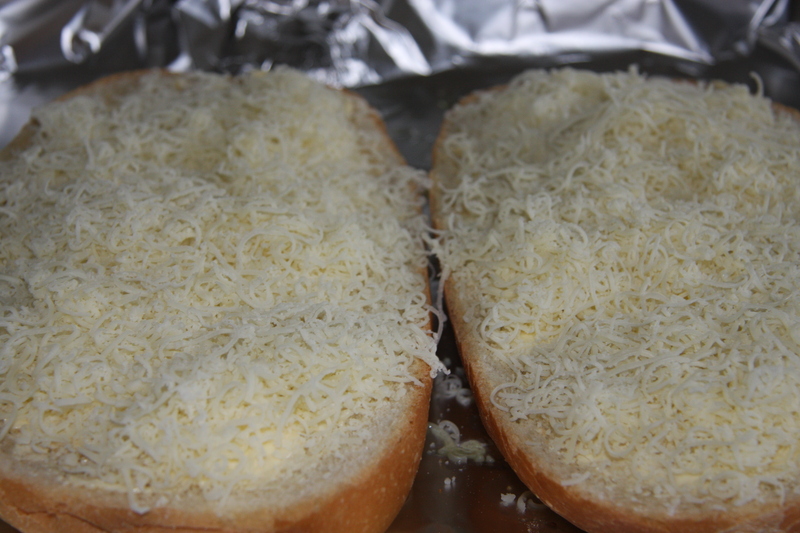 On a foil lined baking sheet top each piece with grated mozzarella cheese. As much as you like. Place in a preheated 350 degree oven until the cheese melts. Remove and slice into the size pieces you would like. 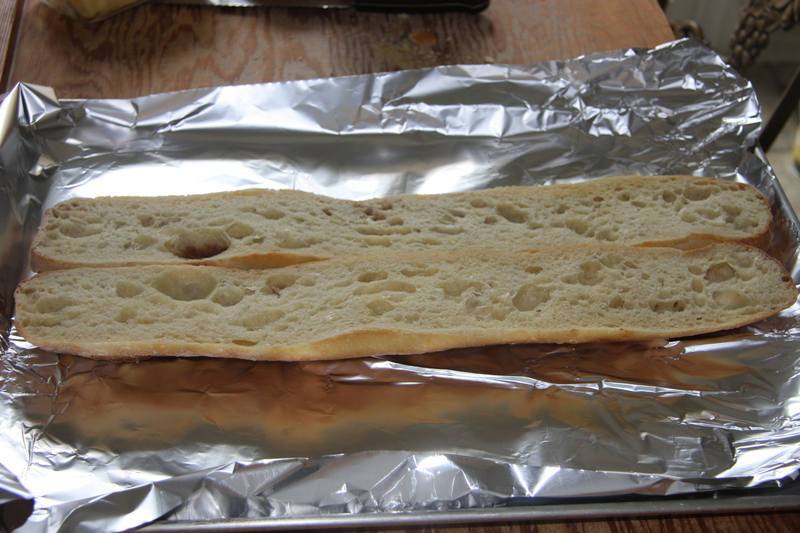 With the ciabatta loaf, place it on a foil lined baking sheet and place it under the broiler until it has a nice golden color. Making sure not to burn it. 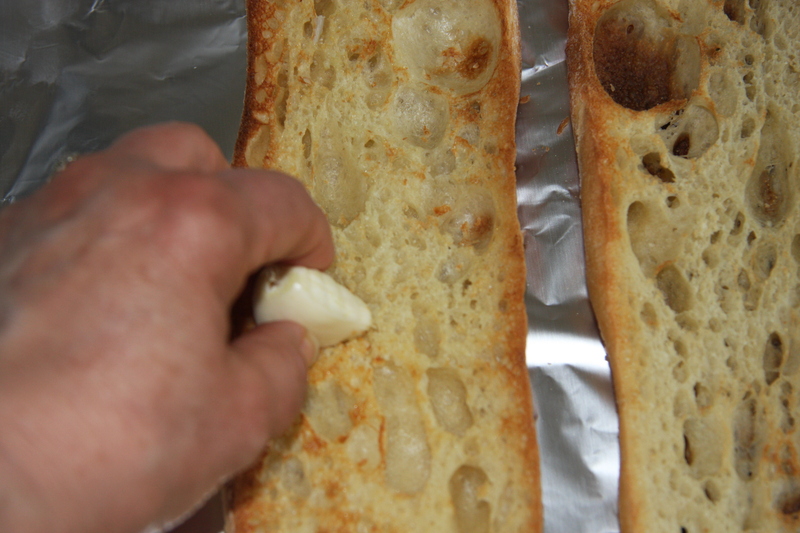 Take some fresh garlic cloves, peel them then rub them along the bread, scrubbing really well. You will be able to see that the garlic will start to shrink. Then with some olive oil top each side. Again the amount is really up to you. Slice and it’s ready for a meal. 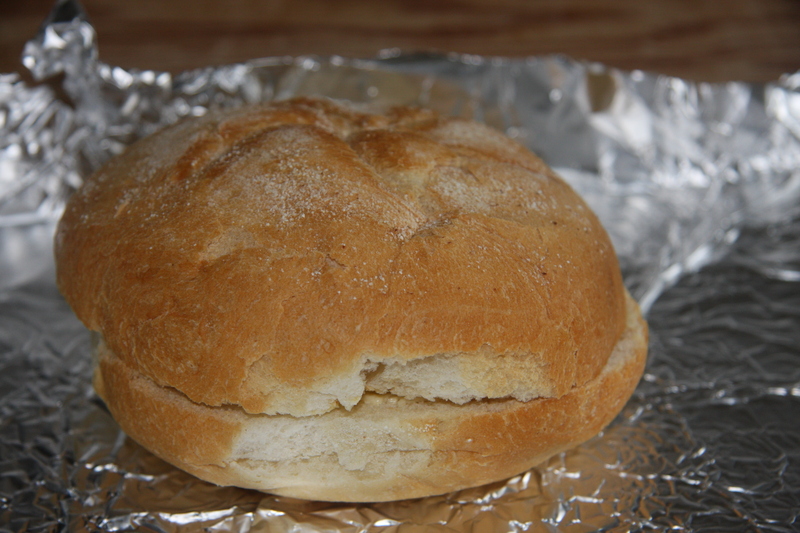 As you can see the kaiser bun has been prepared exactly the same as the Italian loaf. 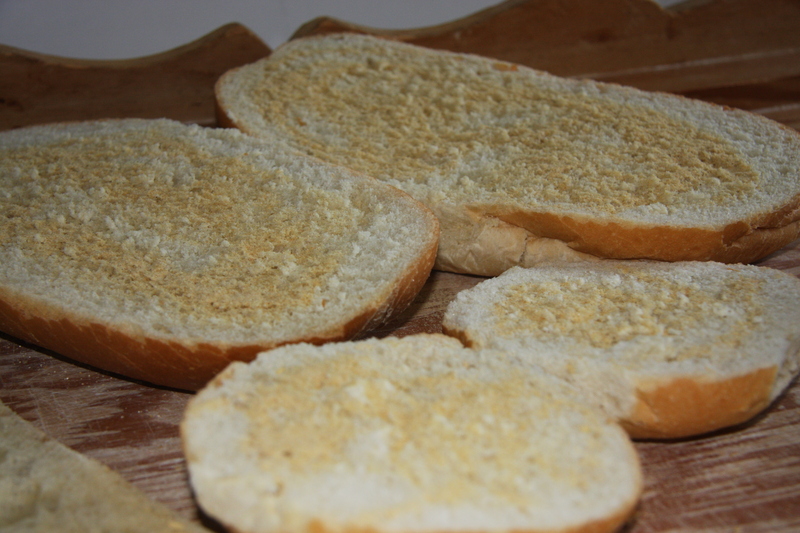 Sprinkled with granulated garlic and topped with butter. Place the 2 sides together onto foil, wrap and put into a 350 degree oven for 40-45 minutes. This is exactly how I make the sliced bread. When putting them together, think of it as making a garlic sandwich. After each slice has been sprinkled with garlic and buttered, place the two pieces together. If you have 8 pieces, that’s 4 sandwiches. Start to stack them together with the buttered sides facing each other. Wrap in foil and place into a 350 degrees oven until all the butter has been melted. I also will turn the parcel in the oven. From one flat surface to the other. There you have it. 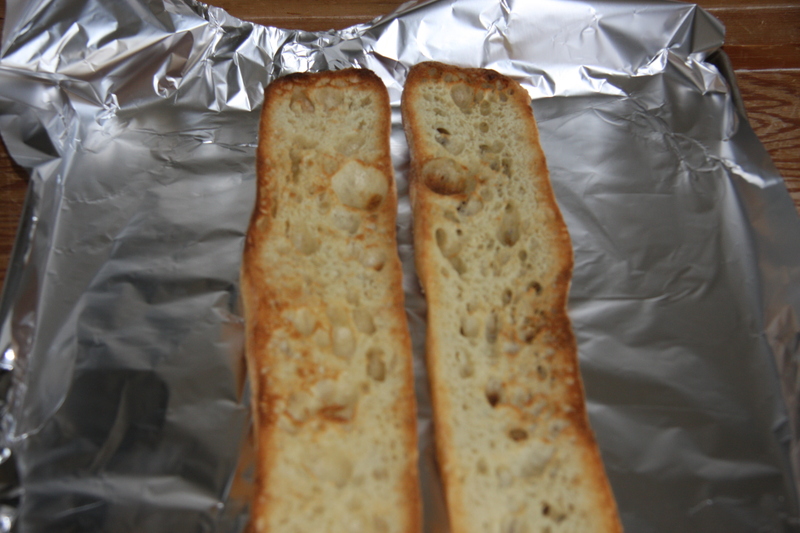 Garlic bread, three simple ways. Slice in half and sprinkle each half with garlic and top with butter. Top with grated mozzarella cheese as the last layer. Place onto a foil lined pan and then into a preheated 350 degree oven until the cheese is melted. Remove and slice. Cut the loaf length wise through the middle. Place onto a foil lined pan and place under the broiler. Broil till you have a nicely golden colour. Remove from the oven and rub with fresh garlic cloves. 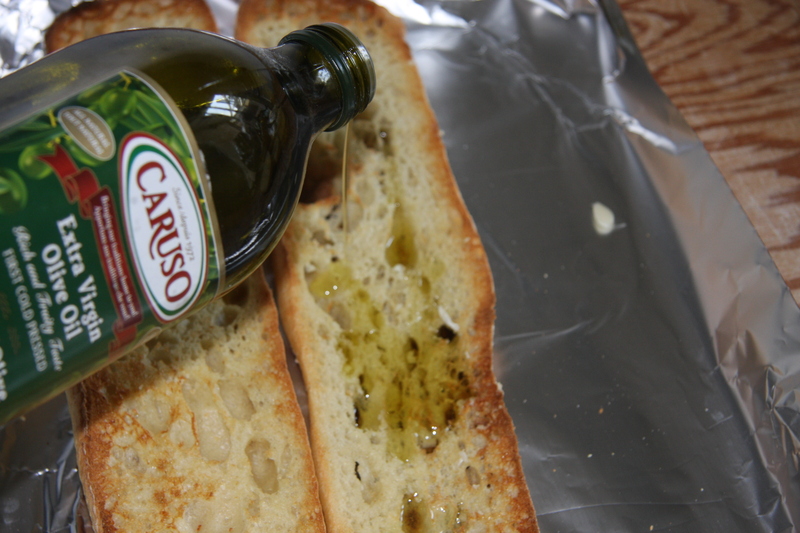 Top with olive oil, slice and serve. Sprinkle each piece with granulated garlic, brush with butter and place the two buttered sides together as if making sandwiches. 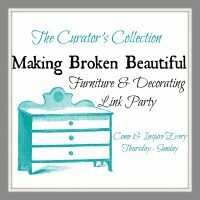 Repeat with remaining pieces. 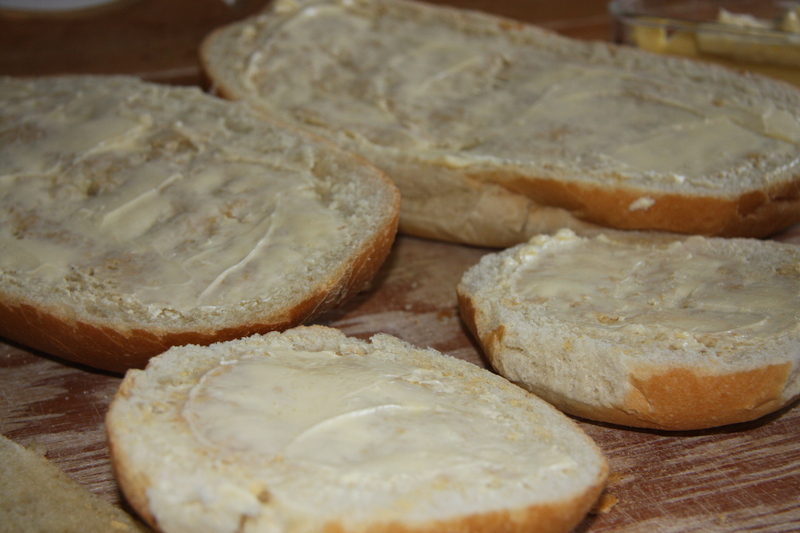 Stack them together when finished, wrap in foil and place them into a 350 degree oven until butter has melted.